Sweetpotatoes are a part of our diet in this household and I grew up eating them. My Mama loves then in every way. 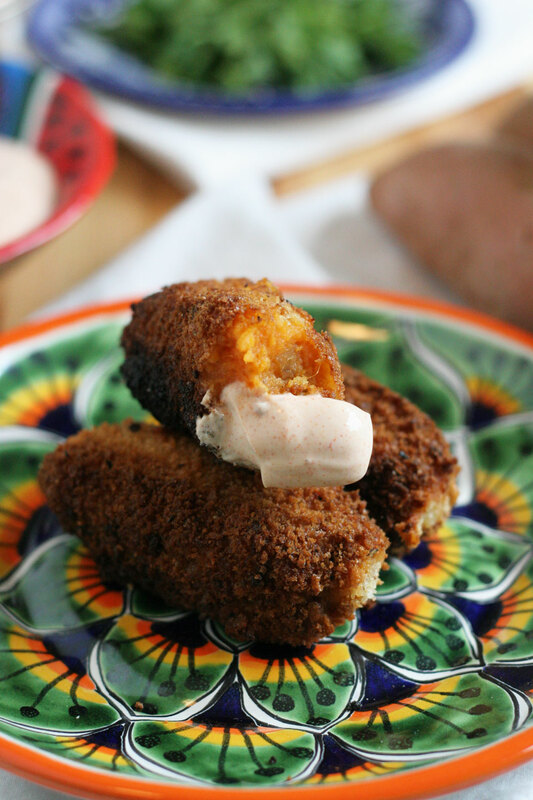 The funny thing, she had never had a sweetpotato croquette, until I made these! Truth be told, until I started recipe testing for this campaign, neither had I. I am super happy I did, these are super good! 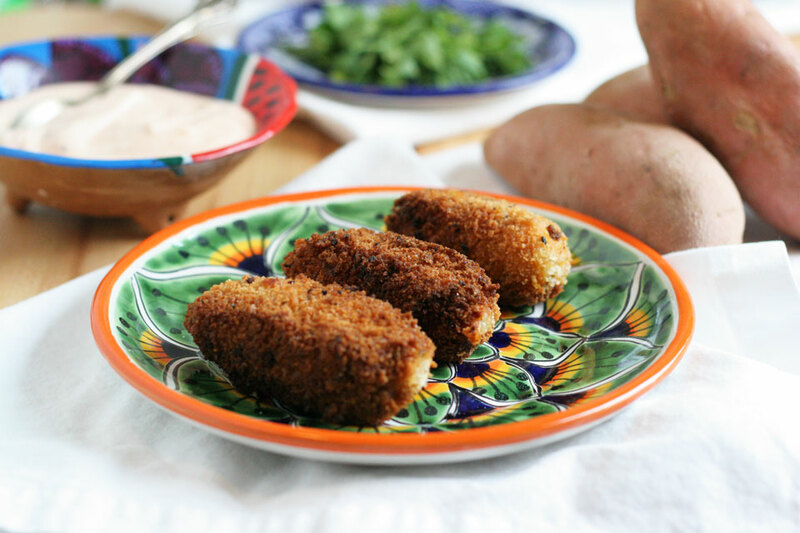 Growing up in Mexico in a Spanish family we ate croquettes often, and typically made with a white potato. Which is traditionally how they are made. My Tia Paty made them, we ate them. My Mama and I are especially fond of them. I remember the first time I made them with Tia at the house where I grew up in Sacramento. It isn’t often I recall the first time I made something, especially if it was from my childhood. But I do remember this, because my Mama was super sick at the time and my Tia came to visit. I remember wanting to learn how to make croquettes because I loved eating them, so naturally I wanted to make them myself. I seem to remember being a teenager, not totally sure though. But I recall making them with my Tia Paty and eating them with the family. Honestly it was even more of a no brainer for this campaign to make croquettes with California Sweetpotatoes. I eat them regularly but often when I am presented with a product to develop a recipe for, I want to be sure it is unique, approachable, and tasty. Sweetpotatoes are that, versatile, extremely healthy, full of nutrients, and easy to cook. You can roast, grill, boil, bake with them, mash, steam, and puree them. How could you not find a way to eat them?!! When I make croquettes I usually make them with a cheese and a meat. Because sweetpotatoes have a strong flavor that pairs well with just about everything, it was easy to go with a traditional Spanish cheese like Manchego and spice it up with a Mexican chorizo. You can serve these with or without the yogurt sauce, as they are good on their own as well. The other cool thing is, you can make them ahead of time, freeze them, then fry them up when you want or need them. Note: Boil 3-4 large sweetpotatoes in a large pot with 1 tablespoon fine sea salt, cover and cook for 30 minutes. Strain and mash. I leave the skin on because it has amazing nutrients. In a large bowl add the sweetpotato, Manchego cheese, chorizo, salt, and pepper, mix well to combine. From into 2 inch long cylinders or use a small scooper to form into balls. Place in fridge for 30 minutes. Heat oil over medium high heat in a large pan or skillet. Test oil temp by placing a sprinkle of panko bread crumbs, if it fries, it is ready. If it fizzles, heat longer. Do not fry until oil is hot, the croquettes will absorb too much oil if it is not hot enough to fry. Once oil is hot, keep at medium high heat. Dip croquette in beaten egg then roll in panko crumbs, carefully place in hot oil. Fry 5 croquettes at a time, you do not want to overcrowd the pan. Fry for 3-5 minutes, turning once, until golden brown. Remove with a slotted spoon and place on a paper towel lined plate. Place yogurt, lime, paprika, salt, and pepper in a small bowl, whisk to combine, serve with warm croquettes. Store leftovers, if any in an airtight container for up to three days. To warm, use a toaster oven to crisp. Yet, best served fresh. This is a wonderful recipe. Any thing with sweet potatoes makes me happy. But the manchego and chorizo puts it over the top. Oh, my gosh, does this flavor combination sound amazing! What lovely croquettes! 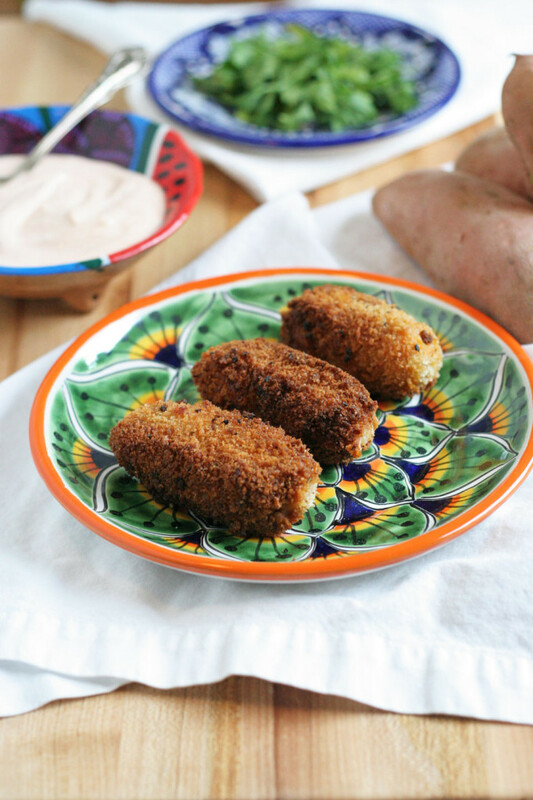 Croquetas – oh how they remind me of home! Sweetpotatoes in this recipe sound genius! These are stunning! 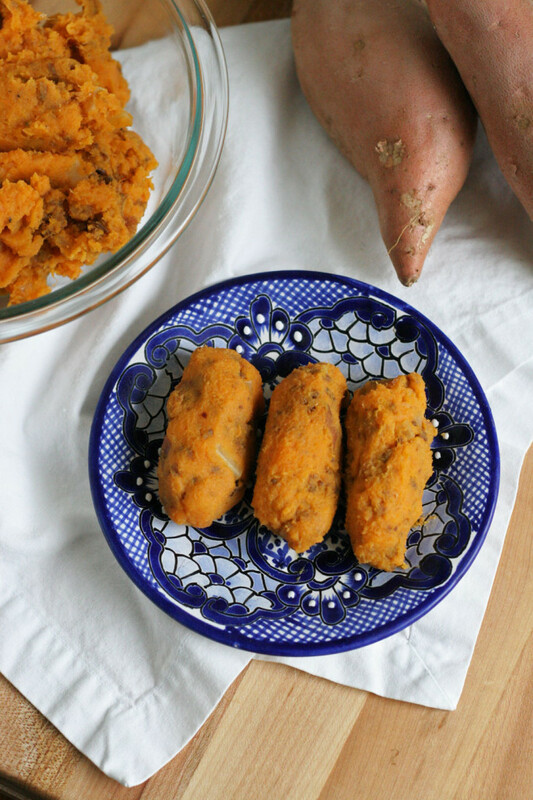 Sweet potatoes are one of my favorite vegetables to play around with! I don’t know why I don’t often make croquettes at home. What a great way to use sweet potatoes. I love that it’s almost sweet potato season! These croquette’s look amazing! You had me at Manchego and Chorizo. What an awesome flavour combo!